Brojash is an attempt to remember the seven ingredients of a full-spectrum soda: berry, root, oil, juice, acid, sugar, herb. Sometimes you just need an acronym. This soda brings the berry idea way forward, taking advantage of a sale on usually quite expensive blackberries. The root in this case is the very mild astragalus, which provides a creamy, smooth background note. The oil comes from fermented cacao nibs, which offer a slight but noticeable chocolate cast, and Seville orange zest. The juice is also from Seville oranges, and it provides an acid tang. Raw cane sugar adds restrained sweetness and apple mint a diaphanous herbality. Either fresh or frozen berries can be used, as the fresh ones are frozen anyway to help extract juice by breaking their cell walls. If they are fresh, they can be processed just before they start to turn overripe. They are pulped and strained to remove the seeds, and the pulp is macerated with the nibs, juice, and herb for 48 hours in the fridge. It’s heated to 65C and the sugar and astragalus are stirred in. The syrup is cooled and the soda is bottled with the frozen syrup method. 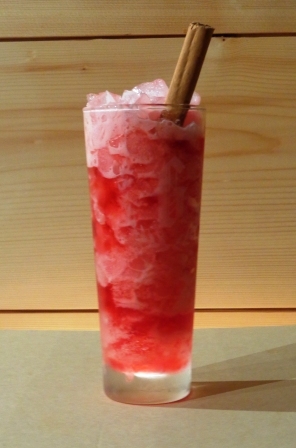 Pour it over ice, stir it with a cinnamon stick, it’s a softly minty blackberry chocolate delight. This entry was posted in Uncategorized and tagged blackberry soda recipe, fermentation, homebrewing, soft drink, umami.